Michael, I certainly didn't expect to find a vegetarian recipe here! 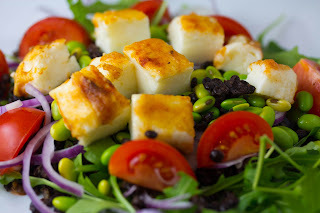 And, just think, if you used tofu instead of halloumi, it would be a VEGAN recipe! I'm astonished! What can I say - sometimes I can surprise in a good way too. As a good friend said to me about this dish - "it would be really nice as a side salad for a good steak".